Some solid sleepers are emerging in the 2021 class in Wisconsin and Sam Kick of Onalaska High School is one such talent. A 6-1 155 pound plus guard, Kick is continuing to open eyes in the Badger state with his play on the hardwood. A solid blend of skill and athleticism, Kick is a solid on and off the ball defender with versatility who can guard the 1, 2, or 3 on defense with positive results. His instincts are advanced and he has a nice feel for the game defensively making him a highly intriguing dual threat talent that impact the game on both ends of the floor. Offensively Kick sees the floor well, he delivers timely passes, he has a decent handle, and he’s shown the ability to control the tempo and make plays scoring and creating with the ball. Equipped with an excellent perimeter stroke, Kick can hit the trey ball with consistency (i.e. 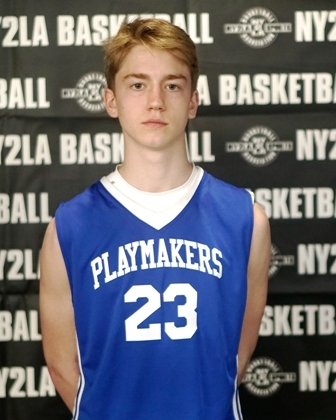 56% as a freshman for Onalaska) and he has shown an improved ability hit the mid-range jumper on occasion. Still developing as a prospect, Kick stood out this past spring and summer and he’s really just starting to scratch the surface of his potential. With continued growth and development both physically and skill wise expect to hear a lot about the talented sophomore from Onalaska who looks the part of another potential Division 1 prospect in Wisconsin in the class of 2021. Kick plays with the Wisconsin Playmakers during the grassroots travel season.